Derailed By Fire And Disarray, Congo Delays Presidential Election — Again It has been over two years since President Joseph Kabila was scheduled to step down. But after Thursday's announcement, voters will have to wait a bit longer to finally cast their ballots. 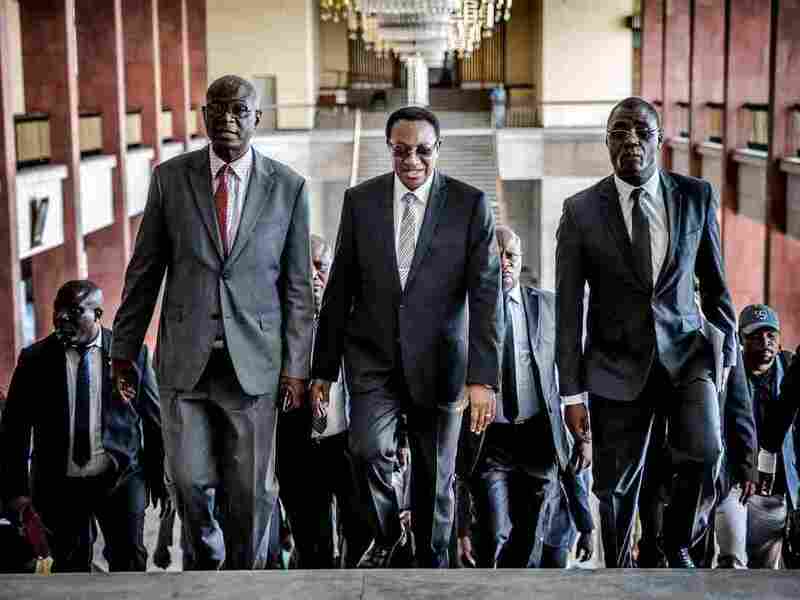 Bruno Tshibala (center), the prime minister of the Democratic Republic of the Congo, arrives for a meeting Thursday with the country's electoral commission president about postponing the presidential election. Three days before voters were finally to cast their ballots for president, authorities in the Democratic Republic of the Congo declared something that's become familiar: another delay. The electoral commission announced Thursday that elections to replace President Joseph Kabila already two years behind schedule, have been postponed to Dec. 30. The commission, known as CENI, revealed the delay during a private meeting with the presidential candidates — including opposition candidate Seth Kikuni, who tweeted afterward that CENI is "technically unable to organize the elections this Sunday." Commission officials formally announced the move later Thursday at a news conference in the capital, Kinshasa. The decision comes just one week after suspected arson destroyed nearly 80 percent of the city's voting machines in a massive blaze. At the same time, in war-torn regions more than 1,500 miles to the east, Congo remains deeply embroiled in the worst Ebola outbreak in its history, with some 550 suspected and confirmed cases since the start of August. Still, Sunday's vote offered a glimmer of hope for a country that long grappled with doubts that presidential elections would be held at all. Kabila, 47, has held power since 2001, when he took office after his father's assassination, and the term-limited leader has spent the past two years repeatedly delaying the election to decide his successor and violently cracking down on dissenters who protested the delays. Supporters of opposition leader Martin Fayulu flee a plume of teargas fired by police Wednesday in the capital, Kinshasa. And though Kabila confirmed earlier this year that he would not try to stand for re-election, security forces stirred fears of renewed repression during recent clashes with opposition supporters. 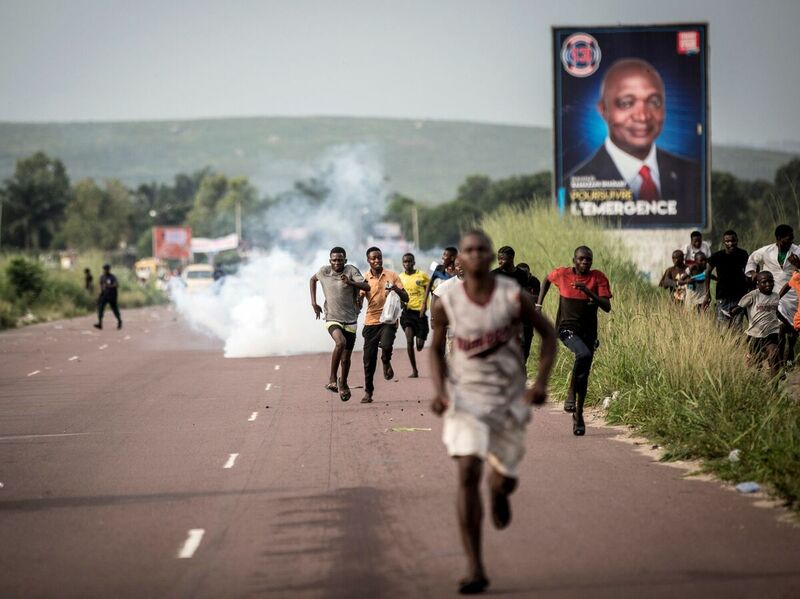 Several people were killed in the bloodshed last week, and Kinshasa Gov. Andre Kimbuta, a member of the ruling coalition, banned campaigning in the capital on Wednesday, citing security reasons. The disarray of recent days has called forth unpleasant memories among the Congolese, who are no strangers to violent and unstable elections — including the past two presidential votes, which saw Kabila retain power despite rampant fighting and claims of fraud. On Wednesday, as rumors of a potential delay circulated, one of the opposition front-runners, Martin Fayulu, told Reuters it would be unacceptable to postpone the vote. "The CENI president said there will be an election rain or shine on the 23rd of December," he said. "We cannot accept a change of [CENI President Corneille] Nangaa's position today." Another candidate, Noel Tshiani, applied a more positive spin to the decision. "If the elections are postponed," he tweeted Thursday, "let's seize this opportunity to organize 4 presidential debates to enable the Congolese people to get to know the candidates better."